Business Women of KZN unite! As the voice of women in business, the Business Women’s Association of South Africa (BWASA) is the largest and most prominent association of business and professional women in the country. It plays a key role in highlighting the current status of women in leadership and acts as a lobby group that advocates on women’s business issues in an effort to transform the economy. 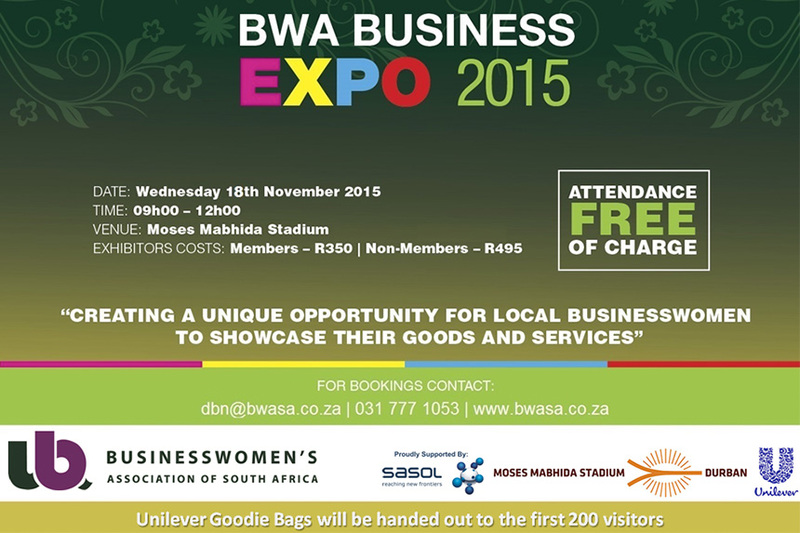 The BWA Durban Business Expo is a highlight on their busy calendar and aims to showcase many of the local businesswomen in Kwazulu Natal. Exhibitors will include local entrepreneurs, social enterprises, corporate companies and retailers. If you would like to participate as an exhibitor, please contact the BWA Offices on the contact details below and book your place. The Business Expo is relevant to any women in business no matter where they are in their business journey. Date: Wednesday, 18 November 2015. Venue: Definitely an exhibition with a difference, the expo will take place on the pitch, giving attendees an incredible view of the stadium. Hospitality: Food and beverage stalls will be available to purchase from on the day. Follow BWA Durban on Twitter and be sure to check out the action with us using #MMSLive (@MMStadium).